Avocado is a creamy high protein rich fruit which adds texture to any meal. This fruit is also known as butter fruit. Addition of this fruit is great to any healthy recipes. Such avocado dessert recipes is perfect when you need something sweet especially after your lunch meal. I prefer having some yummy creamy less sweet pudding recipes, which is easy to whip. This creamy smooth yummy avocado pudding recipe is really a new twist to dessert recipes. This is a rich treat and enjoy this delicious dessert mindfully. 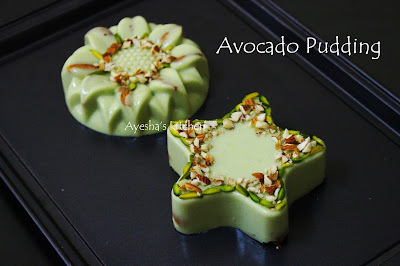 So lets see how to make avocado pudding or quick dessert / avocado pudding vegan . Cut the avocado in the center and remove the seed of avocado. Scoop the flesh discarding the skin and blend its flesh alone to a fine paste in a blender without adding water. Soak the china grass/agar agar in cold water for few minutes and then cook over a slow flame until it dissolves to a clear liquid. 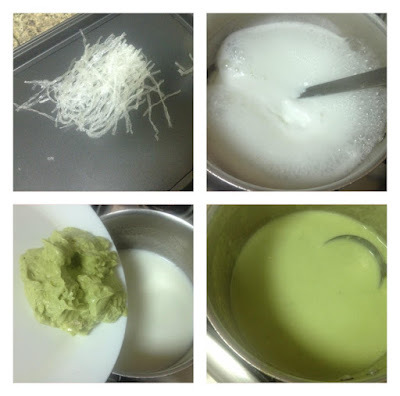 Meanwhile, boil the milk in a vessel and once boiled, add the creamy avocado paste along with sugar. Then add the condensed milk and mix well without any lumps. Now transfer it to a bowl through a strainer. This is to avoid lumps if any. Now pour the melted china grass to the milk mixture stirring continuously and mix well. Pour it into the pudding tray and once cooled, refrigerate it until sets. 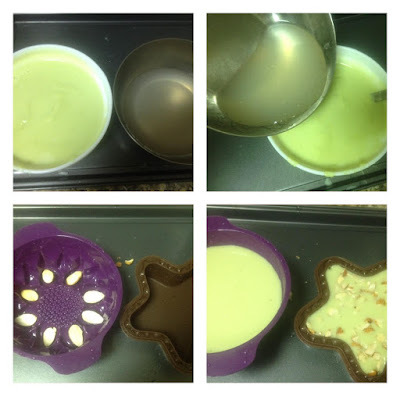 I used silicon molds for this pudding recipe. Decorate with chopped almonds and sliced pistachios.